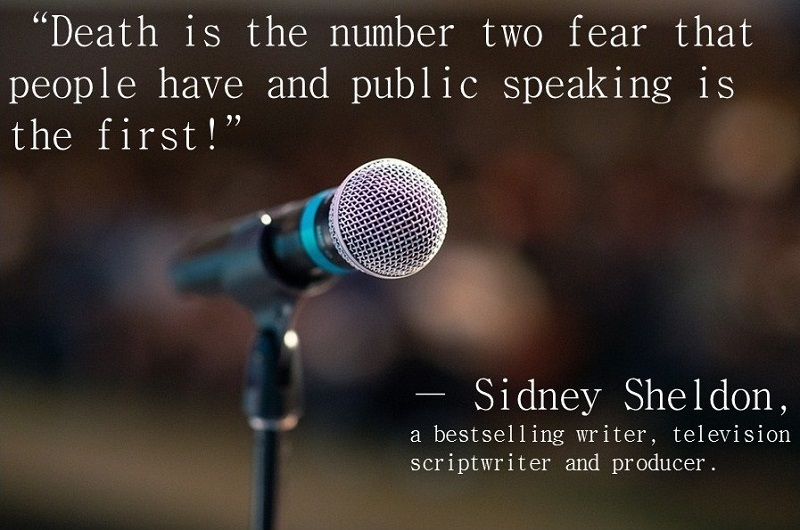 Public speaking isn’t meant only for educators or presenters. And if you think, “I won’t have to speak publicly”, you go wrong. All of us have the opportunity to speak in public – meetings, conferences, speaking clubs, presentations, etc. You might not feel like you are in a public speaking situation now, but still, you’ll have to present in front of an audience. Be it your friends or educators, you need to capture their attention for at least a short period of time. Giving a speech in public and speechwriting of itself are hard (doubly so if you happen to suffer from any form of social anxiety). But when you have to do it without any preparation, it may turn into a truly paralyzing and embarrassing experience. Dacher Keltner, a professor of psychology at the University of California, shares his most embarrassing public speaking moment in Forbes. There is, however, a solution – always keep in mind a couple of topics relevant to your field of study that you can use if the occasion arises. Not only it can help you avoid public humiliation but also impress your fellow students and teachers due to your resourcefulness – you know what to speak about and how to do it effectively. Health and State of Mind: Do You Believe that Both Ill and Good Health Begins with the Wrong or Right State of Mind? What Do You Believe the Rarest Human Quality Is in Today’s World? Which Quality Do We Need More to Make the World a Better Place? Children and Television: Should the Two Be Kept Apart? Is the Television’s Influence on Children Really All That Negative? How Important Are Educational Institutions for Real Education? How Much Learning Actually Happens in the Classroom? Should the Traditional Educational Arrangements Be Altered? The Extent to Which Mass Media Control What and How We Think. In Reality, How Independent Are Our Opinions and Decisions? Are Team Sports Important for Character Formation? Does Participation in Them Actually Help Develop One’s Personality? Are Intelligence and Education Really the Two Most Important Person’s Characteristics? What Was the Hardest Thing You’ve Ever Had to Do (Intellectual, Emotional, Moral, etc.)? Describe and Discuss Your Dream Job. Does It Even Exist? Does a Smoking Ban Infringe the Rights of Smokers? What Famous Person, Either Living or Dead, Would You Like to Meet in Person the Most? Are Exams (Tests, Multiple Choice Tests, etc.) Good Means of Knowledge/Skills Assessment? What Would You Undertake If You Had a Hundred Percent Guarantee of Success? As you may see, possible topics for impromptu speeches cover all spheres of life and all areas of knowledge. If you have a ready-made topic tucked out in the back of your memory all the time, you will never be caught off-guard! But, you’ll never feel all at sea if you follow the steps to make a good speech in public. As extempore speeches involve no preparation and practice, you are likely to brighten up, “Wow! I don’t need to get prepared for my speech!” Don’t push your luck! There are some effective steps on how to make a spontaneous speech look well-prepared. The golden rule that wins for spontaneous speaking is that the more you know, the more you can speak about. However, William Shakespeare expressed quite the opposite idea in his play, King Lear, or The Tragedy of King Lear – “Have more than you show, speak less than you know, lend less than you owe” that is more peculiar to life relationships. But if you want to effectively speak in front of any audience, it is better to have a solid knowledge base that you can enrich with the help of regular reading various news articles, for example, on The New York Times, BBC News or any other you like in the list of 8 things to read to enhance your general knowledge. Today, with the wealth of knowledge available online to any field of study, there’s no excuse not to gain knowledge. It is always interesting to listen to a speech where a speaker shares his/her own experience – “When I was little …”, “When I visited this country …” or “When my friends helped me …”. All these phrases pay off accordingly – your listeners start being engaged in the speaking process. Moreover, when you ask them some questions, a kind “What was your experience in a similar situation?” or “Are there those who experienced the same feelings?”, you’ll hook your audience. Everyone will start thinking and comparing themselves with you as a speaker. Perhaps, you’ll motivate someone to face the same valuable experience or vice versa. But when you don’t have any personal experience, what will you share with your listeners? Think of it! So if you’re one of the people who get nervous just thinking about the phrase “public speaking”, what will you do when you are asked to speak in public? Cope with anxiety. Don’t think that it is much easier to advise it than performing in practice. Matt Abrahams, a passionate, collaborative and innovative educator, author and coach, is sure that 50% of speakers who don’t feel anxious during public speaking according to research findings are liars. You can watch his TED talk about this issue and find some practical solutions to handle communication anxiety. Alternatively, you can apply 5 tips for reducing public speaking nervousness right now. You have learned what exactly an extempore speech is, what topics are possible for this way of public speaking. Moreover, you have learned no less important information on how to get prepared for an extempore speech. Sounds strange “to get prepared for the speech that doesn’t require any preparation”? Nevertheless, we direct you to the best possible results in speaking on extempore topics. Use this advantage!